Firmly in the shadows is where the banned Muslim Brotherhood organisation has always wanted to keep its female members. Yet, ironically Brotherhood women have also been a form of cover that the organisation has been quick to use in the crises the outlawed Islamist group has encountered from the mid-1940s through the political deals with the former Mubarak regime and up to the pact that followed the 25 January Revolution in 2011 and led to a Muslim Brotherhood president in Egypt. If the organisation’s founder, Hassan Al-Banna, formulated his ideas to furnish a theological and legal faҫade that would enable the Muslim Brotherhood to claim that it seeks only the advancement of Islam and the preservation of Islamic Law, the organisation’s strategies and consummate pragmatism have in fact shown up the contradictions between word and deed. This has been most clearly shown in the status of women in the Muslim Brotherhood. One the one hand, women are seen as “shadows” that silently follow their husbands, submitting themselves in their capacities as wives, daughters or sisters. On the other, they have served through their many roles to advance the organisation’s ends. The contradiction could not be starker. Between the two poles lies the expanse of injustice and hypocrisy that female Brotherhood members have experienced at the hands of an organisation whose attitude towards women has always swung between proscription and exploitation. Al-Banna himself was very clear about where he thought women belonged. “The affairs of daily life fall under two categories. The first is earning a living and the means towards this end such as the management of factories, stores and fields. The other is the management of the home, the preparation of the family needs, and the bearing and nursing children… To men falls the toil, the earning of an income and the management of affairs outside the home. To women falls the home and the management of domestic affairs,” he wrote. Such attitudes have remained a permanent fixture of Brotherhood literature and its organisational and hierarchical arrangements since. Yet, from the time Al-Banna founded his organisation in 1928 to the present women have been a priority for Brotherhood recruitment operations. In 1928, Al-Banna founded the Brotherhood’s Mothers of the Faithful School, and in 1933 he formed the Muslim Sisters Department of the Brotherhood, setting out its main operations and basic tasks. This department served as the chief instrument for recruiting female members to the organisation until its first debacle in the mid-1940s. In her memoir My Journey with the Sisters, former secretary of the Muslim Sisters Fatma Abdel-Hadi wrote that the purpose of the department was to disseminate the Brotherhood’s call among women throughout Egypt and to establish branches in every governorate and city. Al-Banna met with members of the department once a week in order to deliver a religious sermon, she said, a practice that he continued until his assassination. By 1949, the department had around 150 branches across the country, and these mostly remained untouched by security clampdowns, unlike the Brotherhood premises frequented by men. At the same time, they were effective in extending Brotherhood influence through the social services offered to women and their families. “The Muslim Brotherhood would set out the programme of our tour to each city before we went there. We would stay in a house selected in advance. There we would meet with women, giving them lessons and steering them towards reading certain books and undertaking certain tasks. We took pains to wear the same type of outfit, a headscarf and a long jacket. We also contemplated designing a face veil at the time,” Abdel-Hadi wrote. In addition to exploiting women to produce new generations indoctrinated with Brotherhood beliefs, the organisation also used them to recruit other women targeted for their social status and influence. Its first major coup in this regard was Labiba Ahmed, a prominent activist in the women’s movement of the 1919 Revolution who joined the Brotherhood shortly after it was established, bringing with her the Nahda (Awakening) of Egyptian Women Society that she had founded in 1921 and the Women’s Nahda magazine that served as its mouthpiece. Ahmed became head of the Muslims Sisters under Al-Banna, although it was Al-Banna’s secretary, Mahmoud Al-Gohari, who actually controlled the activities of the department until his death in the early 1960s. Another conquest in the organisation’s campaign to bring women from prominent and influential families on board was Amal Al-Ashmawi, daughter of minister of education Al-Ashmawi Pasha, in 1948. Abdel-Hadi says in her memoirs that it was Al-Ashmawi’s social and material standing that led Al-Banna to appoint her head of the board of the Muslim Sisters, then headquartered in the Mounira district of Cairo. “When she became head of the board, she asked her father, the minister of education at the time, to appoint female knitting teachers to train girls in the department’s workshops for girls. Al-Ashmawi Pasha then appointed three graduates with higher arts certificates to teach at the department at the ministry’s expense,” Abdel-Hadi wrote. She also recalls that Amal Al-Ashmawi helped collect donations to support Brotherhood detainees and their families during the Nasserist regime from 1954 until her own arrest in 1965. The Muslim Brotherhood’s famously tight internal secrecy and narrow circles of trust applied to the women’s organisation as well, and the selection of its members began with the wives, daughters and sisters of male Brotherhood members and extended outwards to second and third tier circles of trust. On the fringes were women who sympathised with the organisation’s ideas. These formed the female electoral armies mobilised to bring out votes in favour of male candidates when the organisation decided to participate in the political process in Egypt. This was particularly evident in the 2005 parliamentary elections, in which the Brotherhood won 86 seats in the then People’s Assembly, largely the product of the votes of women in small towns and villages. Not a single seat in the assembly went to a Muslim Sister, even though two Brotherhood women candidates had taken the initiative to nominate themselves. That they were able to do so was most likely due to the fact that they were both wives of senior Brotherhood officials. The first was Jihan Al-Halafawi, wife of Ibrahim Al-Zaafrani, a former member of the Brotherhood Guidance Bureau, and the second was Makarem Al-Deiri, wife of Bureau member Ibrahim Sharaf, one of the most powerful figures in the Brotherhood hierarchy. Many attribute the ultimate failure of these two candidates to the fact that the organisation did not back them sufficiently in their campaigns. “We imagined that this was a form of jihad for the sake of the faith, as had been implanted in our minds. We never felt tired, even though we had been on our feet without a break since the crack of dawn until voting ended at 5pm. We were very zealous, one of us to the degree that she insisted on her right, as a party delegate to monitor the polls, to accompany the ballot box in the police van to the place where the votes were counted to ensure that the boxes were not switched en route. The Sister had to sit alone next to two men in the van’s single front seat,” Abdel-Moneim wrote. The year 1948 proved revealing in terms of what women could do for the organisation in the absence of men who were either in prison or had fled abroad. Following the assassination of the then prime minister, Al-Nuqrashi Pasha, in which the Muslim Brotherhood has been implicated, it was the Brotherhood women who rescued the organisation from collapse, writes Mahmoud Al-Gohari in his book Muslim Sisters. Despite such efforts, Brotherhood hawks and its Guidance Bureau have consistently opposed the advancement of women in the hierarchy of the organisation and even their promotion politically. The men at the top have always resisted any measures that would enable women to demand an effective role and to occupy influential positions. When Jihan Al-Halafawi stood as a candidate for the Raml constituency in Alexandria in the 2000 elections, some Brotherhood officials greeted this enthusiastically, but she received no support from the organisation itself. However, the fact that she had nominated herself encouraged some other Brotherhood women to press for an opportunity to work in the political and administrative decision-making bodies of the organisation. Their demand was adamantly opposed by the organisation’s leadership, especially by such figures as Mahmoud Ezzat and Mohamed Habib. Although the Supreme Guide at the time, Mahdi Akef, signalled a willingness to consider the demand, in the end the Brotherhood’s long-established rules prevailed. All areas beyond the Sisters department were no-go zones for women. This applied in particular to the two main decision-making bodies of the organisation’s Guidance Bureau and Shura Council. Other prominent women have made contributions to the Brotherhood, including Wafa Mashour, daughter of former supreme guide Mustafa Mashour, who until recently directed one of the largest Brotherhood school chains in Egypt, Amany Abul-Fadl, well-known lawyer Hoda Abdel-Moneim and Manal Abul-Hassan. However, the organisation’s rigid hierarchy has not changed its long-standing men-only creed. Following the 25 January Revolution when Brotherhood member Mohamed Morsi resigned from his post in the organisation to run in the presidential elections, Sabah Al-Saqari, who had served as secretary of women’s affairs in the Freedom and Justice Party (FJP), the Brotherhood’s political wing, nominated herself to succeed him. She was unable to garner the necessary support to become a candidate. According to the FJP’s bylaws, a nominee needs to obtain a recommendation from 100 members of the General Congress. This has 1,011 members, of whom only 70 (six per cent) are women. This exclusively male hierarchy has, however, still been keen to recruit women for ballot-box purposes. Abdel-Hadi describes one of its recruitment tactics in her memoir when Brotherhood women were advised to carry a pin with them at all times on public vehicles. If they saw a woman who was “exposed”, meaning not “properly covered”, they were to prick that woman on her naked flesh and then apologise and open a conversation on the “moral obligation of modesty” and the wearing of “religiously correct clothing”, she said. She adds that this method often served as a prelude to recruitment to the Brotherhood. Religiously-correct attire was the official uniform for the millions of Brotherhood women who took part in the elections in the post-January Revolution period. Women accounted for around 40 per cent of the votes cast, and their ballots succeeded in bringing a Brotherhood member to power in Egypt in the shape of former Brotherhood president Mohamed Morsi. It was their votes that secured his lead in 17 Upper Egyptian governorates, where, according to the Supreme Electoral Commission, Morsi prevailed in all the Upper Egyptian governorates apart from Luxor. Although election results are not broken down by gender, the map of how Brotherhood services are distributed in Egypt largely explains why Morsi won in these governorates, large portions of which had come to rely on the services provided by Brotherhood-run charities and societies. Such societies accounted for why the organisation and other Islamist groups were so popular not just in Upper Egyptian governorates like Minya and Beni Sweif, but also in northern governorates like Giza, Damietta and Kafr Al-Sheikh. “There were women of all classes and ages. I saw university professors and simple rural women. I saw elderly women, young women, and girls of elementary and preparatory school age. Most had come from towns or villages near Cairo. They would spend most of the day at the sit-in and then return to their homes at night. As for the women who had come from further way, they had their own tents,” he wrote. If the break-up of the Rabaa sit-in brought an end to the largest and most intense campaign in Brotherhood history, there subsequently emerged unanticipated movements on the part of women who moved to the fore to sustain the momentum of the demonstrations for the reinstatement of Morsi. Among these were the “Free Female Students” movement, the “Female Students against the Coup” movement, the “Free of Al-Azhar”, a version of the Thawragiya (revolutionaries) that adopted the four-finger “Rabaa salute”, and the “7am Girls”. A Reuters report from December 2014, a time when these movements were at their height, observed that the credit of the Muslim Brotherhood’s ability to survive security clampdowns was due to the role of Brotherhood Sisters in leading protests. 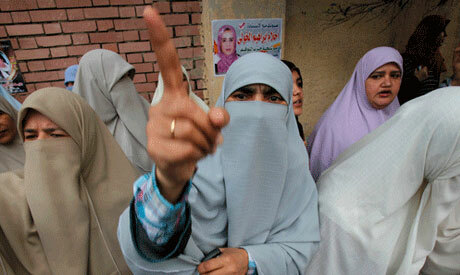 “In homes and streets around Egypt, women are keeping alive a group the authorities are determined to crush. They teach Muslim Brotherhood values to children, organise its protests, preserve its networks, and take an ever more prominent role in politics… With most Brotherhood leaders in jail or exile, women who have long lived in their shadow have been thrust into the vanguard of the organisation’s battle for survival,” it said. The report cited evidence of changes in the role of women in the Brotherhood hierarchy in the aftermath of the dispersal of the Rabaa sit-in. “The Sisters say their role is already evolving. Women are now elected to lead all-women usras, local groups that are the building blocks of the group. Previously, wives of usra leaders acted as informal deputies for women. In some areas, women are elected to lead women’s shubas, which are each responsible for dozens of usras, although women continue to focus on teaching girls how to be good wives and mothers and ambassadors for the Muslim Brotherhood in society,” it said.